Against the backdrop of eroding trust in capitalism, pervasive technology, big data, and the desire to quantify all of our behaviors, The Business Romantic makes a compelling case that we must meld the pursuit of success and achievement with romance if we want to create an economy that serves our entire selves. Viktor Frankl published his seminal book, Man’s Search for Meaning, more than 60 years ago, but it is only recently that presence of meaning and purpose have become a workplace and work-life focus. Today we expect more from our job than a paycheck. We expect a sense of fulfillment — a sense that we are doing something important and good. We want to be happy at work. 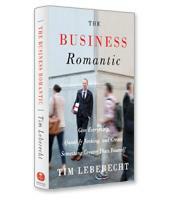 In a meandering, 250-page exploration called The Business Romantic, veteran marketer Tim Leberecht takes our yearnings at work a step further: Through business and work, he declares, we are seeking romance. It is not surprising that in the big data, ubiquitous high-tech world of the 21st century, people might yearn for a bit of romance — romance as in mystery, danger, discovery, joy, ambiguity. Most of us, however, would not think of the business world as the location for this romance. For Leberecht, however, business is the perfect venue. He notes that we are all immersed in business — as leaders, workers and consumers — every day of our lives. We have closer relationships with our colleagues than with our neighbors and even spend more time with them than with our loved ones. And it is not just the social aspects of business that are important, but also opportunity. Through business, he writes, we can make a difference; we can make the world a better place. And so much more. We can find nostalgia, for example. In a chapter entitled Take the Long Way Home, Leberecht explores the emergence of nostalgia in business. One example is the rapid rise of the Maker Movement, where people have the opportunity to relive the joy of craftmaking. Even the most modern of our new products are in a sense nostalgic. The tablet allows us to directly touch what we are working on. Facebook, Twitter, Instagram and Pinterest are based on the age-old desire to share with others. Giving more than you receive is another of the “rules of enchantment” that form the core of the book. Leberecht quotes the work of Wharton business school professor Adam Grant, whose book Give and Take explored the role of giving in a business context. Grant found that companies that fostered giving behavior in their employees benefited from improved employee performance, notably in areas such as collaboration and innovation. Filled with a wide variety of stories from business around the world, Leberecht presents in The Business Romantic a compelling call-to-arms to break the business-as-transaction mold and infuse the workplace with romantic elements that will engage and inspire employees and their leaders.